7th Pay Commission : bunching of stages in the revised pay structure under Central Civil Services (Revised Pay) Rules, 2016. ** No. A-60015/1/2016/MF.CGA(A)/NGE/7th CPC/480 ** Government of India, Ministry of Finance, Department of Expenditure , Controller General of Accounts Mahalelkha Niyantrak Bhawan, E Block, GPO Complex, INA, New Delhi-110023, Dated: 10th August, 2017** OFFICE MEMORANDUM ** Sub: Recommendations of 7th Central Pay Commission- bunching of stages in the revised pay structure under Central Civil Services (Revised Pay) Rules, 2016. Sub: Recommendations of 7th Central Pay Commission- bunching of stages in the revised pay structure under Central Civil Services (Revised Pay) Rules, 2016. Attention is hereby invited to this Office OM of even number dated 23 rd February, 2017 on the subject cited above vide which the pay details of Shri Babu Balram Jee, AAO, CPWD, lBBZ-l, Malda M/o Urban Development were made available so that benefit of bunching may be extended to eligible AAOs in adherence to the Department of Expenditure OM No. 1-6/2016-IC dated 7th September, 2016. 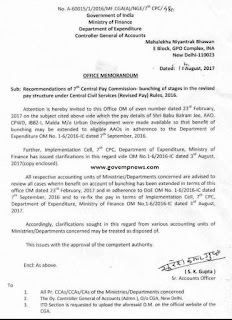 Further, Implementation Cell, 7th CPC, Department of Expenditure, Ministry of Finance has issued clarifications in this regard vide OM No.1-6/2016-IC dated 3rd August, 2017 (copy enclosed). All respective accounting units of Ministries/ Departments concerned are advised to review all cases wherin benefit on account of bunching has been extended in terms of this office OM dated 23rd February, 2017 and in adherence to DoE OM No. 1-6/2016-lC dated 7th September, 2016 and to re-fix the pay in terms of Implementation Cell, 7th CPC, Department of Expenditure, Ministry of Finance OM No.1-6/2016-lC dated 3 rd August, 2017. Accordingly, clarifications sought in this regard from various accounting units of Ministries/Departments concerned may be treated as disposed of. 2. The Dy. Controller General of Accounts (Admn. ), O/o CGA, New Delhi. 3. ITD Section is requested to upload the aforesaid OM. on the official website of the CGA. of stages in the revised pay structure under Central Civil Services(Revised Pay) Rules, 2016. 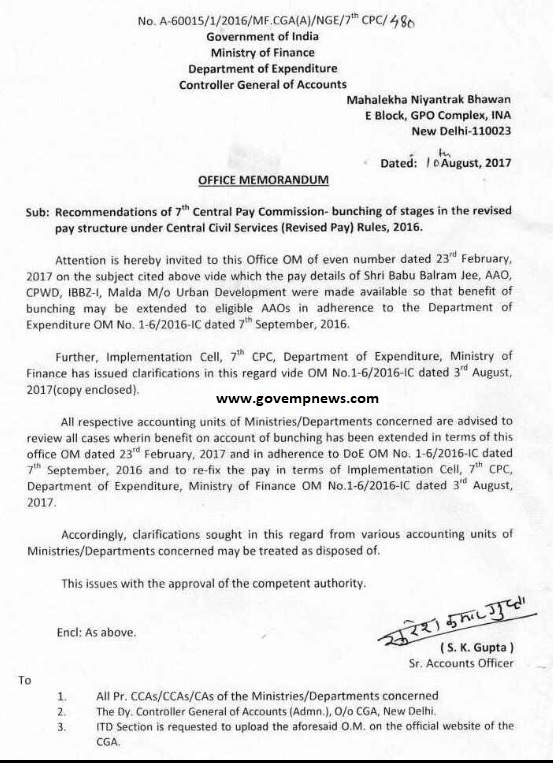 With reference to the subject mentioned above and in continuation of this Departments OM of even number dated 07 09.2016 and 13-06.2017, detailed instructions are hereby being issued on the application of the benefit on account of bunching of stages while fixing the pay in the revised pay structure as a response to a large number of references received from Ministries/Departments. 2 The provisions giving effect to the recommendations of the 7th CPC on extending the benefit on account of bunching were notified vide DoE OM dated 07.09.2016. Benefits on account of bunching have been extended during the initial fixation of pay in the revised pay structure while implementing the recommendations of earlier CPCs also. Bunching occurs in the fixation of pay when the pay at two or more consecutive stages in a Pay Scale/Grade Pay in the pre revised scale get fixed at the same stage in the corresponding Pay Scale/ Level in the revised pay structure. regards the benefits to be extended on account of bunching. the 5th CPC recommended benefit of one increment for every four consecutive stages bunched, the 6th CPC recommended benefit of one increment for every two consecutive pay stages bunched. For HAG scales however, benefit of one increment was given at each of the pay stages in the 6th CPC pay structure. para 5 1.37 of the 7th CPC Report. Department of Expenditure's O M dated 07.09.2016 provided that a difference of at least 3%, the rate of annual increment, in the 6th CPC pay structure was essential for counting of two stages. The 6th CPC had replaced the system of equidistant pay stages in a pay scale based on equal annual increments in the 5th CPC regime by a system of annual increment of 3% on the sum of pay in the running pay band and the Grade Pay which was to be added to the running pay as increment. Therefore, the pay stages in any given Grade Pay were specific to an employee and depended upon the initial fixation of pay in that Grade Pay. As a result, the amount of increment earned in the same Grade Pay would differ in the same Pay Scale/ Grade Pay not only between different employees but also across years for the same employee. To illustrate, an employee whose pay was fixed at Rs. 46,100 in GP of 8700 in PB-4 would have the first annual increment of Rs 1390 which would be added to his running pay in the Pay Band, another employee whose pay initially was fixed at Rs. 46,400 in the same Grade Pay would have the first annual increment of Rs 1400. In such a scenario where the pay stages are specific to the employee, it is not possible to arrive at universal pay stages for the purpose of determining the exte3nt of bunching. Therefore, for the purpose of determining the extent of bunching in a system of running pay bands, the consecutive pay stages that need to be considered are the pay stages which are specific to the employee. 6. In the 5th CPC structure, the maximum and the minimum of every pay scale were well defined in the 6th CPC structure. Entry Pay was separately notified for most Grade Pay levels to govern the entry pay of direct recruits in that level. The pay of those moving from a lower grade to a higher one on promotion was regulated in terms of provisions contained in Rule 13 of CCS (RP) Rules, 2008. As such the Entry Pay notified for a given Pay Scale/ Grade Pay is the effective minimum lof that Grade Pay for direct recruits. For an employee getting promoted, the sum of the minimum of the relevant Pay Band and the Grade Pay is the effective minimum pay. The 7th CPC, in its Report, has commented that this led to many situations where direct recruits drew higher pay as compared to personnel who reached that stage through promotion. Demands were received by the 7th CPC from many staff associations and employees for removal of this disparity which the 7th CPC refers to as differential entry pay. and its corresponding pay stage in the revised pay structure. As a result, all pay stages below the Entry Pay in any Level will on re-fixation, converge to the first pay stage in that level. As this convergence takes place on account of a conscious decision of the 7th CPC intrinsic to the architecture of the Pay Matrix by indicating the Entry Pay as the starting point of each Level, benefit on account of bunching cannot be extended with reference to pay stages lower than the Entry Pay indicated by the 7 th CPC for that level in the Pay Matrix. Extending the benefit of bunching with reference to pay stages below the entry pay will perpetuate the difference in pay on account of differential Entry Pay which was addressed by the 7th CPC. 8. Based on the above, it is clarified that the following shall be kept in view while determining the extent of bunching as also the benefits to be extended on account of bunching at the time of initial fixation of pay in the 7th CPC pay structure. (i) Benefit on account of bunching is to be extended when two or more stages get bunched. (ii) Benefit of one increment is to be extended on account of bunching of every two consecutive stages. (iii) As stipulated in MoF OM dated 07.09.2016, a difference of 3% to be reckoned for determination of consecutive pay stages, specific to each employee. (iv) All pay stages lower than the Entry Pay in the 6th CPC pay structure as indicated in the Pay Matrix contained in the 7th CPC Report are not to be taken into account for determining the extent of bunching. 9. All Ministries/ Departments are advised to review all cases wherein benefit on account of bunching has been extended in terms of this Deparetment’s Om dated 07.09.2016 and to re-fix the pay in terms of the instructions contained herein.